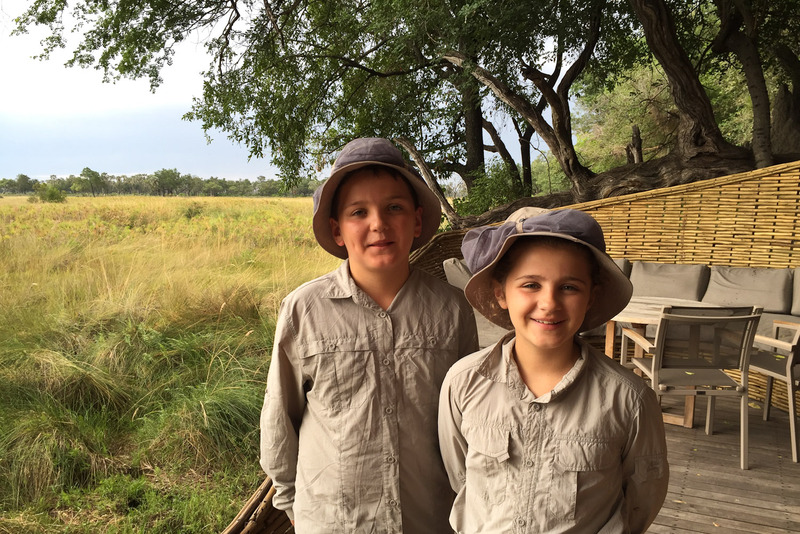 Archie and Lulu dressed for safari, replete with mozzie net hats. Sally Webb on the importance of being over-prepared when travelling with the family. We’re currently travelling in southern Africa, visiting among other destinations the Okavango Delta in Botswana, via a Mack Air charter flight from the city of Maun. It’s a bit of an Out of Africa experience, complete with giraffes at the end of the airstrip as our single-engine Cessna Grand Caravan flies in. And I’ve just learnt the hard way that things don’t always go to plan no matter how meticulous your preparations. Botswana is a malarial area and I was vigilant about being prepared with several GP consultations to discuss the efficacy and side effects of the available anti-malarial medications. We’re two days into our course of Malarone (the most expensive of the malaria prophylactics, but with the fewest side effects) when my son leaves his backpack containing all our drugs as well as his EpiPens for anaphylaxis (he’s got a severe nut allergy) under the aircraft seat. We don’t realise until the single-engine plane, which operates like a taxi service in these parts, is well on its way to its next stop. I’m furious (inner control freak rearing its ugly head– all that meticulous planning!) and extremely anxious (maternal concern for the family’s health and wellbeing) in equal measure. Fortunately I’ve taken additional precautions against mosquitoes, as malaria is only one of the hideous diseases that they can transmit. As our African adventure continues, it soon becomes apparent that keeping mozzies away is only one of many issues to face family holidaymakers. I’ve equipped the kids with shirts and long trousers made from mosquito-repellent fabric and found some great little fishing hats with netting that folds up and down over their faces. We’ve also travelled with a high-potency repellent and applied it liberally for the early morning and late evening game drives. Our accommodation is well screened with somewhat romantic netting surrounding the beds; you’d be a determined mozzie to get through it. And we’re lucky in a way; southern Africa is in a serious drought so the Okavango Delta, normally covered with water, is really dry. It means fewer animals at waterholes (a negative), but also fewer mozzies (a definite plus). The lovely staff at Sandibe Safari Lodge bend over backwards to retrieve the missing backpack, but we’re not reunited with it for another 48 hours. We restart the course of medication and all is well. No mosquito bites for any of us. All according to plan. Never underestimate the power of a pool when it comes to keeping kids entertained. “Does it have a pool?” is the question we get asked the most by our kids when we mention where we’re staying. It’s such good downtime, an essential but oft-neglected part of any busy travel itinerary. It’s also an instant attitude adjustment for both parents and kids who are hot and bothered after a morning’s sightseeing. I’ve also found the promise of a few hours splashing about an effective trade-off for things I want to do that the kids might not instantly embrace. If all else fails, resort to bribery. On the aforementioned trip to Africa, I broke one of my golden rules for travel without tears: I forgot to order kids’ meals on the plane. Special meals keep both kids and parents happy on long-haul flights – but you have to order them at least 48 hours before you fly. They tend to be simple dishes like pasta, with things in packets that appeal to juniors and perhaps a juice. Crucially, they arrive before the general meal service, meaning you can have the kids’ trays cleared and the entertainment system back on so you can have your meal in peace. Flying with a baby? Prepare a bunch of individual zip-lock bags with a disposable change mat, clean nappy and wipes, and use one each time you need to do a nappy change. So much easier than carting a bulky nappy bag down the aisle and into those miniscule aircraft loos.